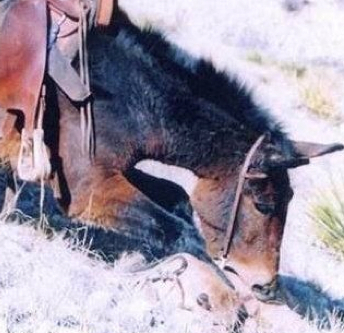 Forget Guard Dogs – Get A Mule! This may be a first… A couple from Montana were out riding on the range, he with his rifle and she (fortunately) with her camera. Their dogs always followed them, but on this occasion, a mountain lion decided that he wanted to stalk the dogs (you’ll see the dogs in the background watching). Very, very bad decision. The hunter got off the mule with his rifle and decided to shoot in the air to scare away the lion, but before he could get off a shot the lion charged in and decided he wanted a piece of those dogs. With that, the mule took off and decided HE wanted a piece of that lion. That’s when all hell broke loose for the lion. Fortunately, even though the hunter didn’t get off a shot, his wife got off these four pictures. That’s a pretty good story eh?! Unfortunately, it’s not true! 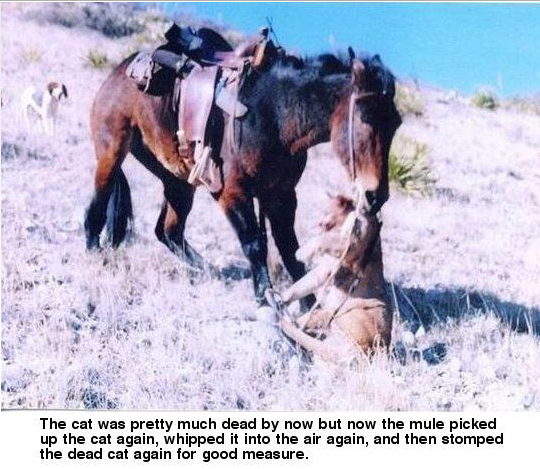 The REAL story is found in this magazine article and states that the guy riding the mule commonly hunts mountain lions. 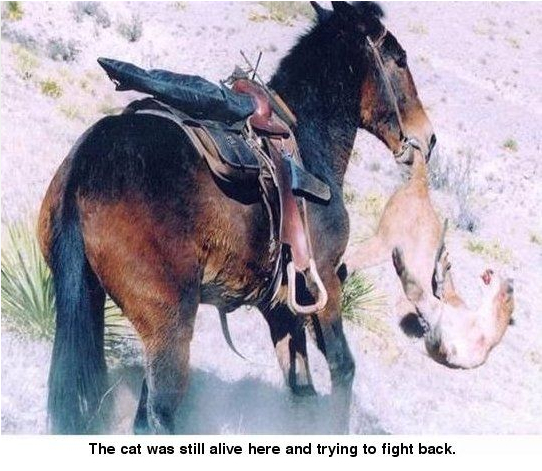 Although the mule seemed to become more aggressive with each hunt, he has never gone after a live cat and the mountain lion had already been shot when these pictures were taken. Donkeys are not guard dogs! 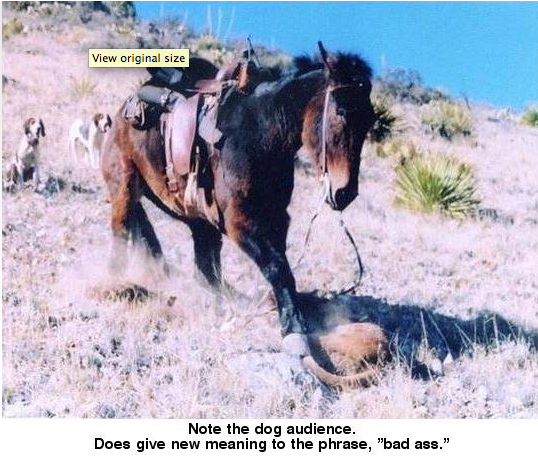 This story does highlight an important issue though – one of which I was previously unaware – is that people ARE using mules and donkeys instead of guard dogs and expecting them to be able to guard livestock! Whether your donkey protects his friends and family, the same way my horses will run off or strike out at coyotes, is no reason to assign an herbivore the job of guarding a group of other herbivores! I had no idea this notion of using donkeys or mules as guard dogs was becoming popular – as a GOOD idea – until I read this article. So yes, although your donkey may be protective by nature, that doesn’t mean it’s a good long-term decision to rely on that donkey to guard your livestock. Just as you wouldn’t rely on a protective horse to guard your livestock either. And in case you’re wondering which breeds make good Livestock Guardian Dogs – they include Great Pyrenees, Akbash, Anatolian Shepherds and Maremma. Guard dogs are predators and are trained to guard herds of sheep and other animals for that reason. To expect a mule or donkey to do that job is ignorant of the true nature of a prey animal and does them a great dis-service. Hi Diane, I clicked your link, don’t know if they changed/updated the info, but right there in 1st paragraph it says, “Yes the mule killed the mountain lion.” And then, “The mule finally stomped the cougar to death after biting and throwing it around like a rag doll.” However, it does say that these photos were taken AFTER the mule killed the mountain lion. Which makes sense – in the midst of diving for cover and the mayhem, it would be pretty hard to take pics! No doubt the entire thing was over in less than a few minutes. I’ve also read numerous books and seen videos where people’s donkeys guard their chickens, or other animals. So I don’t think they are a prey animal in the same way horses are. I don’t know much about it though, and I’ve never owned one. When Jody first got the mule and after Jody shot the first lion out, Berry casually came over to the lion and just nuzzled the lion and casually nibbled it. With each lion Berry just got more aggressive. Jody said it didn’t take more than two lions and Berry got really aggressive to the lion and couldn’t wait to get the cat. The lion was dead before the mule Berry took and shook the lion. A lion is a powerful and lethal predator and can easily kill a mule — however a mule can be quite an adversary. Ah, the key word in this article is “cheaper”, as in donkeys are cheaper to own than a livestock guardian dog. That, (and I wish to God that I could use italics to make a point), is the bottom line, not whether donkeys – who are prey animals themselves – can really do the job. This premise started gaining steam back in the 1980’s. Somewhere a donkey happened to get the best of a coyote or feral dog. The owner told his neighbors and someone had the bright idea that all donkeys will kill predators. Why spend $500.00 for a well-bred LGD when you can buy a donkey at auction for five bucks? Gee, throw it out there in the middle of the cow pasture and don’t worry, you don’t have to feed him – he’s got grass! Hoof care? Shoot, he’ll just wear them down with all the walking he will do while protecting my herd! Deworming, vet care? What? I only paid five bucks for the thing, why would I spend a hundred on that? This premise is one of the worst things to ever happen to donkeys in America. I cannot tell you how many phone calls I have gotten from ranchers who put a bullet in a donkey’s head because it was killing their calves, kids or lambs – gee, he is supposed to tell the difference between that dog that does not belong there and a lamb that just hit the ground. This idea is just as bad as using llamas as guardians. My American Mammoth Jackstock donkeys are bigger than some horses (15hh-16+hh), yet will not go after coyotes or dogs that get into their pastures. They run away. It is my job as a livestock owner to protect my livestock, not that of a dumb animal who may or may not give up his life in doing so. Feel free to contact me for photos from around the world of donkeys that have been attacked by dogs. Want to promote donkey ownership? Tell people how intelligent they are, how sweet they are, how sure-footed they are – please do not promote them for a job that was never meant to be theirs. It sounds like a really cool story, that donkeys will guard livestock, but we must employ the scientific method and look for counter evidence if we really want to be rigorously accurate. Oh my gosh, that article is something! And you are certainly making me think here Diane! This is actually a topic I have not given much thought to. And ironically, I was not even aware people were using donkeys as “guard dogs” when I came up with the title of this post! 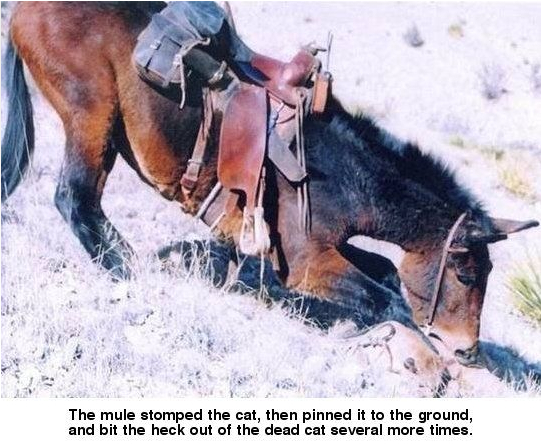 I honestly was just so astounded that a mule would go after a mountain lion – something I had never before considered. And then in the last while I read a book where the woman (who had horses, llamas, goats, dogs, cats and donkeys) told a few stories about how protective her donkeys are. But in common sense terms, why would an animal that relies on its legs as its primary method of defense, risk those legs by placing them in close proximity to large, sharp teeth? I think, as with my horses who will run off coyotes and protect each other, there is a big difference between an animal who will protect its friends and family, and assigning that animal the ROLE of guardian and expecting it to perform that duty without training, assistance, resources or even the physical attributes required. I will add a blurb to the blog post above to highlight this. Actually, I ended up re-writing the post! Thanks again for bringing my attention to this important issue Diane.